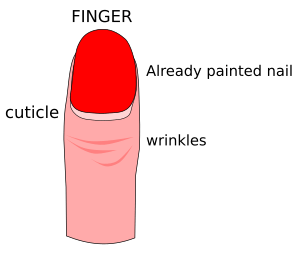 1 The dead skin at the base of a fingernail or toenail. 2 The outer cellular layer of a hair. 3 Botany / Zoology – A protective and waxy or hard layer covering the epidermis of a plant, invertebrate, or shell. Late 15th century (denoting a membrane of the body): from Latin cuticula, diminutive of cutis ‘skin’. Clarice did her cuticles before going to the nail salon because she didn’t want them to think she truly needed their help.